I did this over the past 3 nights. 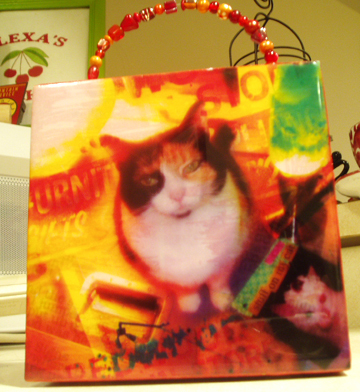 This is a photo/digi design purse I did for Carey (she doesn’t read my blog -or- atleast I hope she doesn’t get a wild hair and decide to peruse it this week before I see her – but I highly doubt she will). Anyway, I designed the images (her cats, Puzzle and Waffle) in Photoshop. I had this great distressed sign image that I incorporated into the images of the cats. I wanted the images to be grungy and kinda gritty looking- but colorful. If you can’t tell, Waffle (the yellow cat) is laying in a sink and quite content. 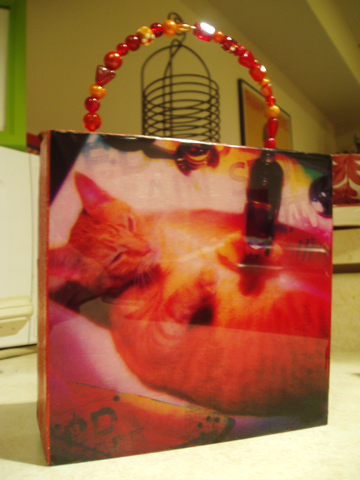 Anyway, I took the wooden purse apart and painted it all with Decoart paints and a stain. I then adhered my images (that were printed on a Laserjet color printer – this is key so that they don’t smear or get blurry…inkjet images do this when coated). I then taped off the sides and mixed up Envirotex Lite (my new favorite craft medium) and poured it on top. I let the Envirotex lite cure for about 48 hours, then I pulled the tape off (drips pop right off the tape). I sanded the sides, inked them, then added another copper stain to the sides (it is reddish/coppery looking in nature with distressed qualities). I then created the beaded handle using heavy duty wire and random beads. This is the only part of the process I’m a bit concerned about. The purse came with a bamboo handle, but in an attempt to unscrew it from the box, I accidentally stripped the hole, so I couldn’t put the original handle back in. So, I have wire in place. I tried to jam it in there good and tied where it won’t pop out and I tried to even super glue and glue gun it in place, so hopefully Carey won’t be walking along and suddenly the handle pop off. I’ve got my fingers crossed. This is my first attempt at using the Envirotex Lite and making a custom handle, so I def. have some things I learned, but overall, I think it turned out cute. Next time, though, I will leave the handle on so I don’t have to worry about it. If any of you guys are interested in a purse like this, I will make a one-sided purse for $40 and a two-sided purse for $50. I think this would be a neat idea for a vintage photo or childhood photo. I would like to do one of me over the years in different stages of my life. I think that would be a conversation piece. Everything…design/manipulation, construction will be included, so think about it…Mother’s Day is right around the corner and I honestly think it is so customized that someone will just ooh and ahh over it.